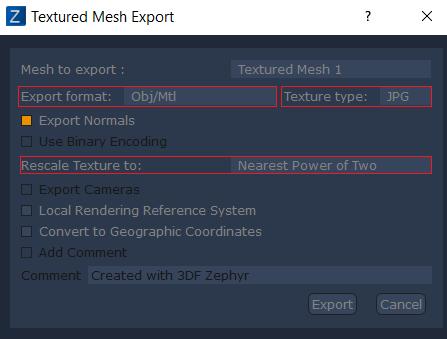 In order to correctly export textured meshes from 3DF Zephyr into Valve’s Destinations, you must keep in mind a few details. All you have to do to make sure that the textured mesh is imported safely into Valve’s Destinations Workshop tools, is simply to select the Obj/Mtl file format with JPG textures. Remember that when extracting textured mesh, zephyr uses the resolution value as a higher limit. It’s not guaranteed (depending on the input images and the scene) that a perfect power of two texture will be generated (which is required by Destinations). To avoid issues, select “Rescale Texture to Nearest power of Two” : while this will not add detail to the extracted texture, an upscaling will be performed (if necessary) to fit this requirement. Textured mesh exported with this process will be ready for import into Destinations with no other pre-processing required. Note that if you are using geographical coordinates, you may need also to check “Local Rendering Reference System” as well. 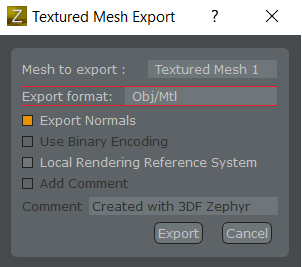 Make sure to select Obj/Mtl as export format. All 3DF Zephyr versions up to 3.007 will export the texture as a png file. Open the texture (eg. myTexture.png ) in your desired editor (GIMP, Photoshop, …) and save it as JPG. Make sure it’s a power of two, otherwise rescale it to the nearest power of two value (for example, a 160×160 pixels texture should be rescaled to 256×256 pixels).